Unless something weird has occurred, either the basketball game is cancelled, the football game is cancelled, or Churchill never entered Switzerland. If any game is cancelled, then something weird has occurred. Nothing weird has occurred. Therefore, Churchill never entered Switzerland. I have trouble whenever “either or” comes into play. 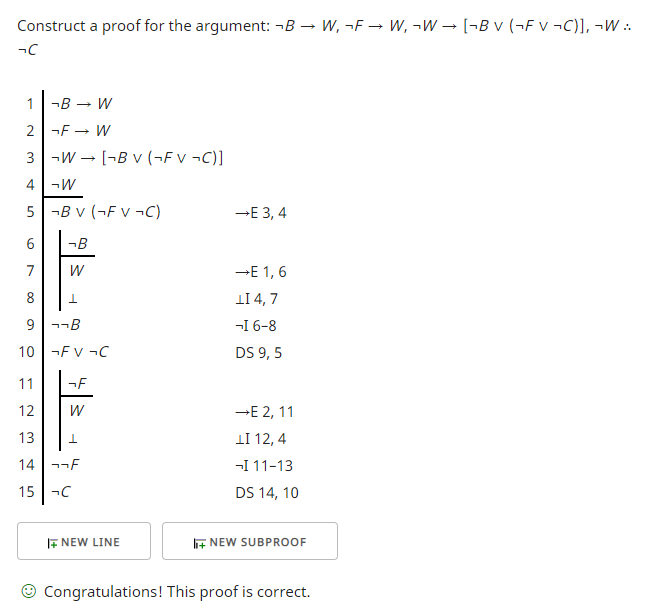 Is this argument valid or invalid, and why is that the case? The “either or” phrase confuses me and complicates the argument to no end. The argument is valid, and happily this doesn't depend on whether the disjunction is exclusive or inclusive. If it is not the case that something weird has occurred, either the basketball game is cancelled, the football game is cancelled, or Churchill never entered Switzerland. Either the basketball game is cancelled, the football game is cancelled, or Churchill never entered Switzerland. If any game is cancelled, then something weird has occurred. I agree with @Bumble's answer. I offer this as a different way to approach the problem. Since validity depends on the form of the argument and not the meaning of the English language sentences, the meaning of those sentences may become distracting. It may be worthwhile to abstract away that meaning by creating a symbolization key for the sentences and then checking the validity with a proof checker. This introduces some risk since the symbolization key may be a source of error. Hopefully it avoids the distraction that paying too much attention to the English language meaning provides. W : Something weird occurs. B : The basketball game occurs. F : The football game occurs. ¬B → W If any game is cancelled, then something weird has occurred, that is, if basketball is cancelled, then something weird occurred. ¬F → W If any game is cancelled, then something weird has occurred, that is, if football is cancelled, then something weird occurred. ¬W → [¬B ∨ (¬F ∨ ¬C)] Unless something weird has occurred, either the basketball game is cancelled, the football game is cancelled, or Churchill never entered Switzerland. As Bumble notes: "'unless' has the same truth table as 'if not'". ¬W Nothing weird has occurred. ¬C Churchill never entered Switzerland. Conditional elimination (→E) can be found in section 15.3 of forallx. Contradiction introduction (⊥I) occurs if two lines contradict each other. Negation introduction (¬I) can be found in section 15.7. Disjunctive syllogism (DS) can be found in section 16.2. Although in this particular example, using a proof checker may be more difficult than keeping the English language meanings in mind, it provides a way to check one's answer if one is only concerned about the validity of the argument. Unless something weird has occurred. Whenever you have "P unless Q", translate into "if not Q then P", i.e : (~Q ⊃ P) . So, the first sentence is (W stands for "Weird") : (~W ⊃ P). What is P here? everything that comes after "occurred," until the end of the sentence. P = either the basketball game is cancelled, the football game is cancelled, or Churchill never entered Switzerland. Now, your main difficulty is with "Either ... or ...", I agree that this is tricky, often logicians use it to mean inclusive "or". The basketball game is cancelled, the football game is cancelled. The second premise is ~W (nothing weird has occurred). The third premise is ((B v F) ⊃ C)) (if any game is cancelled then Churchill never entered Switzerland), only B and F stand for cancelled games. The conclusion is C (Churchill never entered Switzerland). But the first premise then is false, since the antecedent ~W is 1 (because W is 0), and all the disjunction in the consequent has the truth value of 0. Which makes the first premise false in this case. So, the argument is valid, since we could not make the conclusion false and the premises true.